Blepharitis is the medical term for inflamed eyelids. You may notice tired, or gritty eyes, which may be uncomfortable in sunlight or a smoky atmosphere. They may be slightly red, and feel as though there is something in them. What is the cause of blepharitis? The eyelids have tiny glands in them, especially the lower lids. These glands make substances that mix with tears, and help the tears to spread across the eye. As you get older, and particularly if you have dry skin, these glands can block. Without the substance that makes the tears spread, the tears break up, and dry patches develop. These patches make the eyes feel sore or gritty. Treatment is needed to unblock the glands in the eyelid, which may be infected and inflamed, like acne on the face or a tiny boil. Treatment is also needed to replace tears if the eyes are dry. 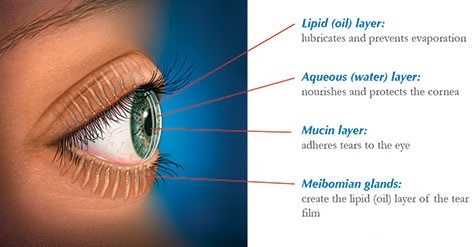 Lubricants - Lubricants can be helpful to both assist the spread of your own tears and lubricate the eye, and replace tears if you have dry eyes. Gels are quite helpful. These products are harmless; try and see if they help. You can buy them, but if you need them regularly they can be obtained on prescription. Antibiotic ointment - If the cleaning is not helpful , in addition your eyes may feel more comfortable if you use antibiotic treatment. This will need to be prescribed. Sometimes the condition returns once the ointment is stopped, and you may need a repeat prescription. Some people benefit from using the creams intermittently. Antibiotic tablets - This treatment is sometimes useful if the other treatments do not work. It is particularly effective if you have a skin condition, such as acne rosacea, or very dry skin, or if the edges of your eyelid stays red with many scales. Antibiotic tablets are not suitable for everyone, particularly if you use several other tablets. Severe or persistent blepharitis can occasionally lead to scarring of the eyelid. This leads to lashes growing in toward the eye, which they may rub. The lashes need to be removed, and there are other treatments if they are a frequent problem. Antibiotic tablets may help to eliminate the blepharitis.